Mycorrhizae fungi infection of a flax root. 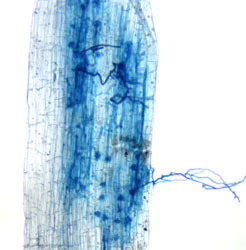 The netting-like filaments are mycorrhizae hypae. The arbusculs, where the transfer of nutrients between host and fungi occur, are shown by the dark circles.